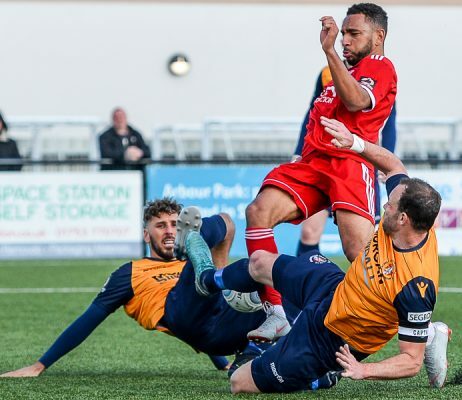 An excellent recent Welling United unbeaten run came to an end at Slough Town. Hosts, Slough are also enjoying a good run and their victory keeps their outside hopes of reaching the play-offs alive. It was nip and tuck early on and the first save of the match was made by Dan Wilks from his own player, David Ijaha who sliced a clearance. Wilks was again called in action when diving low to save a drive from Josh Jackman. Simon Dunn then tried to divert Billy Clifford’s shot into the bottom corner but only served in turning it round the post. Then George Wells put a free kick over but Wilks appeared to have it covered. 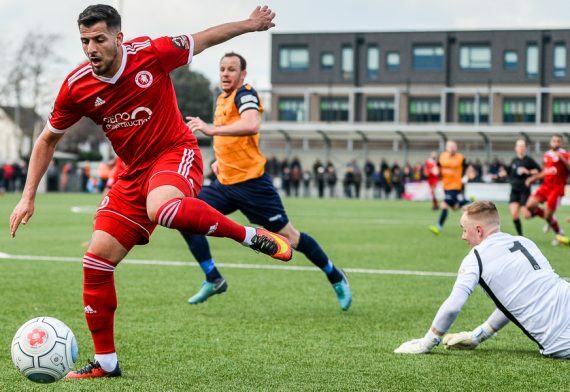 After the break Matt Lench fired into the side netting before Welling made a double change with Bradley Goldberg and Luke Rooney introduced. Warren Harris had a shot saved by Wilks before Welling started to create openings. Arnaud Mendy crossed and Danny Mills headed firmly but Jack Turner did well to save. However the dead-lock was finally broken after seventy-two minutes. Wilks appeared to have Clifford’s shot covered but it took a slight deflection and went over him. Goldberg had a shot comfortably saved then Turner made an excellent one to keep out Mills as Welling looked to get back in the game. Rooney put a free kick onto the roof of the net before Mills headed wide from Craig Braham-Barrett’s slung in cross. Mills headed over once more with Rooney the creator but it was not to be for the Wings. 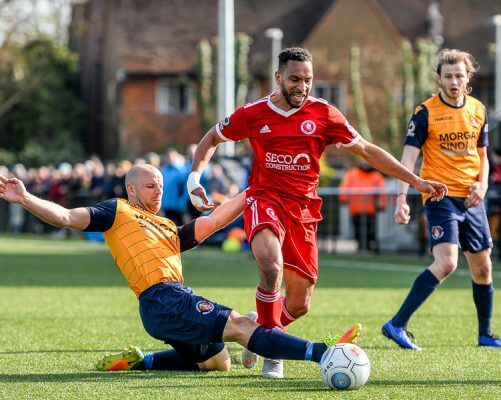 They remain in third place in the Vanarama National League South table, but only one point clear of Chelmsford City who they entertain on Good Friday. Slough Town: Turner, Jackman, Wells, S. Togwell, Nisbet, L. Togwell, Clifford, Lench, Dunn (Williams 67), Amarty (Frasser 77), Harris (Roberts 67). Subs not used: Soares, Phillips. Welling United: Wilks, Braham-Barrett, Genovesi, Mendy, Audel, Orlu, Kiernan, Ijaha, Mills, L’Ghoul (Rooney 51), Bettamer (Goldberg 51). Subs not used: Hill, McCallum, Acheampong. 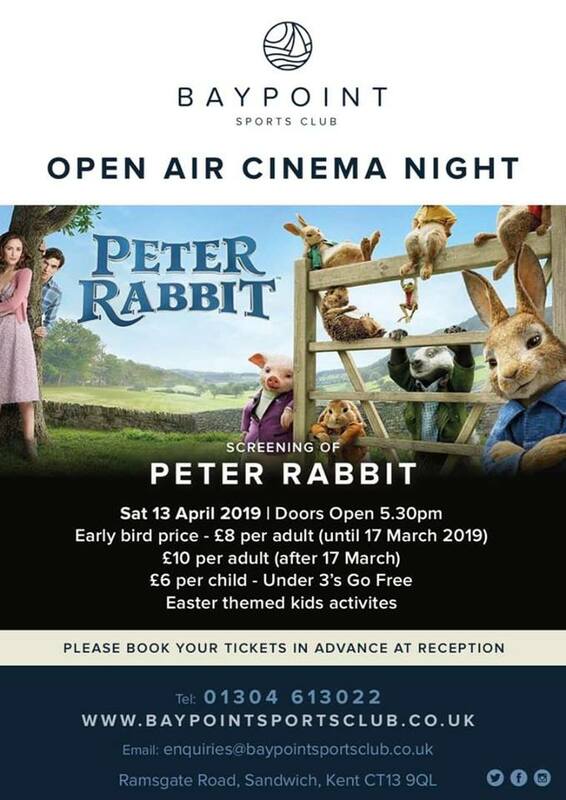 This entry was posted	on Saturday, April 13th, 2019 at 4:51 pm	and is filed under Featured, Football, Non-League Football. You can follow any responses to this entry through the RSS 2.0 feed. Both comments and pings are currently closed.